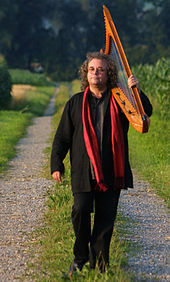 Originally called the Grammy Award for Best New Age Recording, the honor was first presented to Swiss musician Andreas Vollenweider at the 29th Grammy Awards in 1987 for his album Down to the Moon. Two compilation albums featuring Windham Hill Records artists were nominated that same year. The record label was founded by William Ackerman, later an award nominee and 2005 winner for the album Returning. From 1988 to 1991 the category was known as Best New Age Performance. Since 1992 the award has been presented as Best New Age Album. Beginning in 2001, award recipients included the producers, engineers, and/or mixers associated with the nominated work in addition to the recording artists. While "new-age" music can be difficult to define, journalist Steven Rea described the genre as "music that is acoustic, electronic, jazzy, folky and incorporates classical and pop elements, Eastern and Latin influences, exotic instrumentation and environmental sound effects." According to the category description guide for the 52nd Grammy Awards, the award is presented for instrumental or vocal new-age albums "containing at least 51% playing time of newly recorded material", with seasonal recordings not being eligible. The addition of the award category reflected a "coming of age" of the music genre, though some new-age musicians dislike the term "new-age" and some of its negative connotations. As of 2015, Paul Winter holds the record for the most wins in this category, having won six times (four times as the leader of the group Paul Winter Consort). 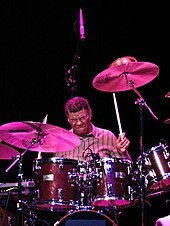 Winter is the only musician to win the award consecutively; he received an award in 1994 for Spanish Angel as a member of his ensemble and another in 1995 for Prayer for the Wild Things as a solo artist. Irish musician Enya has received four awards. Kitarō holds the record for the most nominations, with sixteen (as of 2018, with only one win (in 2001). As of the 2018 Grammy Awards, Peter Kater has been nominated a record thirteen times and finally won his first Grammy for Dancing On Water. Between 2004 and 2018 he was nominated every year, except 2006 and holds the record from the most consecutive nominations (11 in a row). R. Carlos Nakai is the only artist to be nominated for more than one work within the same year—for the 42nd Grammy Awards he was nominated alongside Paul Horn for Inside Monument Valley and for his own album Inner Voices. The group Tangerine Dream holds the record for the most consecutive nominations, with five between 1992 and 1996. All five volumes of Kitarō's Sacred Journey of Ku-Kai series were nominated for Best New Age Album. Paul Winter – "Down in Belgorod"
Enya – "Orinoco Flow (Sail Away)"
Acoustic Alchemy – "Caravan of Dreams"
"Past Winners Search". National Academy of Recording Arts and Sciences. Retrieved March 10, 2010. ^ "Overview". National Academy of Recording Arts and Sciences. Retrieved June 18, 2011. ^ a b "Veterans top Grammy nominations". The Herald. The McClatchy Company. January 8, 1987. Archived from the original on December 4, 2012. Retrieved March 12, 2011. ^ Conner, Thomas (August 28, 2010). "Windham Hill founder Will Ackerman in Chicago for benefit". Chicago Sun-Times. Sun-Times Media Group. Archived from the original on January 9, 2011. Retrieved March 12, 2011. ^ "Past Winners Search". National Academy of Recording Arts and Sciences. Retrieved March 10, 2010. Note: User must select the "New Age" category as the genre under the search feature. ^ a b c Rea, Steven (February 22, 1987). "New-age Music: Hard To Define, But It Sells It Even Has A Grammy Category Of Its Own". The Philadelphia Inquirer. Philadelphia Media Network. pp. 1–3. Retrieved March 9, 2011. ^ "52nd OEP Category Description Guide" (PDF). National Academy of Recording Arts and Sciences. p. 3. Archived from the original (PDF) on October 27, 2009. Retrieved March 10, 2011. ^ Christensen, Thor (January 17, 1988). "Grammy nominee list a bit weightier". The Milwaukee Journal. Milwaukee, Wisconsin: Journal Communications. p. 4E. Archived from the original on July 18, 2012. Retrieved March 10, 2011. ^ "For Your Consideration". Billboard. Nielsen Business Media, Inc. 112 (5): 26. January 29, 2000. Retrieved March 11, 2011. Note: Advertisement. ^ "Mark Isham: Biography". Allmusic. All Media Guide. Archived from the original on 2011-04-20. Retrieved March 11, 2011. 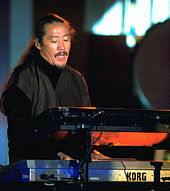 He was nominated for Grammys for Best New Age Performance for his albums Castalia (1988) and Tibet (1989), and finally won for 1990's Mark Isham. ^ Khan, Steve (1997). Contemporary Chord Khancepts. Alfred Music Publishing. p. 6. ISBN 9781576235645. Retrieved June 17, 2011. ^ "Nominations for 31st Grammy Awards". The Boston Globe. The New York Times Company. Archived from the original on November 5, 2012. Retrieved April 7, 2011. ^ "Here's list of nominees from all 77 categories". Deseret News. Salt Lake City, Utah: Deseret News Publishing Company. January 12, 1990. p. W7. Retrieved March 12, 2011. ^ "List of Grammy Awards nominations". Times-News. Hendersonville, North Carolina: The New York Times Company. January 11, 1991. Retrieved March 12, 2011. ^ "Grammy Nominations Span Streisand, Seal, Seattle Symphony". The Seattle Times. The Seattle Times Company. January 8, 1992. Retrieved March 10, 2011. ^ "Grammy nominations". The Baltimore Sun. Baltimore, Maryland: Tribune Company. February 21, 1993. p. 3. Retrieved March 9, 2011. ^ "The 37th Grammy Nominations". Los Angeles Times. Tribune Company. January 6, 1995. p. 5. Retrieved March 10, 2011. ^ "The 38th Annual Grammy Nominations: The Complete List of Nominees". Los Angeles Times. Tribune Company. January 5, 1996. p. 5. Retrieved March 9, 2011. ^ Errico, Marcus (January 7, 1997). "Babyface, Celine Dion Dominate Grammy Nominations". E!. Archived from the original on June 29, 2011. Retrieved March 11, 2011. ^ "40th Annual Grammy Awards: Final Nominations". Billboard. Nielsen Business Media, Inc. 110 (3): 79. January 17, 1998. Retrieved March 11, 2011. ^ Marine, Craig (January 6, 1999). "Grammys go ga-ga for Lauryn Hill". San Francisco Chronicle. Retrieved March 9, 2011. ^ "A Complete List of the Nominees". Los Angeles Times. Tribune Company. January 5, 2000. p. 5. Retrieved March 10, 2011. ^ Boucher, Geoff (January 4, 2001). "Grammys Cast a Wider Net Than Usual". Los Angeles Times. Tribune Company. p. 7. Retrieved March 11, 2011. ^ "In a Distance Place". Allmusic. All Media Guide. Archived from the original on 2012-01-25. Retrieved March 11, 2011. Note: Source used to verify full names of musicians. ^ "Final Nominations for the 44th Annual Grammy Awards". Billboard. Nielsen Business Media, Inc. 114 (3): 90. January 19, 2002. Retrieved March 11, 2011. ^ "The complete list of nominees". Los Angeles Times. Tribune Company. January 8, 2003. p. 5. Retrieved March 10, 2011. ^ "46th Grammy Awards – 2004". Rock on the Net. Retrieved March 11, 2011. ^ "47th Annual Grammy Awards". VH1. Retrieved March 9, 2011. ^ "Will Ackerman: Biography". Allmusic. All Media Guide. Retrieved March 21, 2011. ^ "The Complete List of Grammy Nominations". The New York Times. The New York Times Company. December 8, 2005. Retrieved March 9, 2011. ^ "Nominations for 49th Annual Grammy Awards". E!. December 7, 2006. Retrieved March 9, 2011. ^ du Lac, J. Freedom (December 6, 2007). "Grammys: And The Nominees Are..." The Washington Post. Washington, D.C.: The Washington Post Company. Retrieved March 9, 2011. ^ Conner, Thomas (December 3, 2008). "Complete list of Grammy nominees". Chicago Sun-Times. Sun-Times Media Group. Archived from the original on February 8, 2015. Retrieved March 9, 2011. ^ Venutolo, Anthony (January 31, 2010). "Grammy awards: Complete list of nominees". The Star-Ledger. New Jersey On-Line. Retrieved March 9, 2011. ^ "Complete List of Nominees for the 53rd Annual Grammy Awards". E!. December 1, 2010. Retrieved March 9, 2011. ^ Unterberger, Andrew (6 December 2016). "Here Is the Complete List of Nominees for the 2017 Grammys". Billboard. Retrieved 6 December 2016. This page was last edited on 19 April 2019, at 08:46 (UTC).